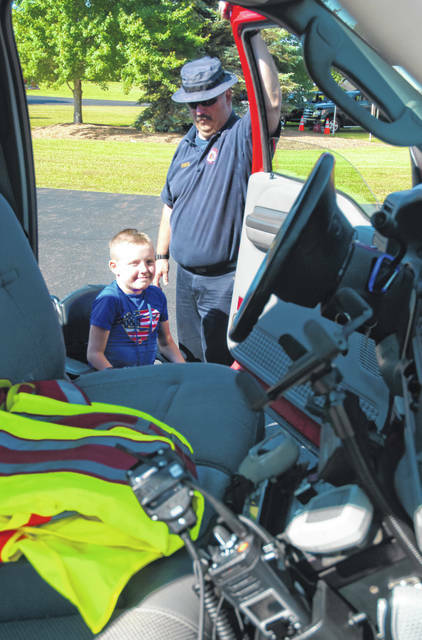 Recreation Unlimited camper Tristen Waller, left, of Beverly, marveled at the equipment in one of Tri-Township’s utility vehicles as Troy Morris, right, a Tri-Township firefighter, explains what each piece of gear does and how it is beneficial in fighting fires and performing rescues. 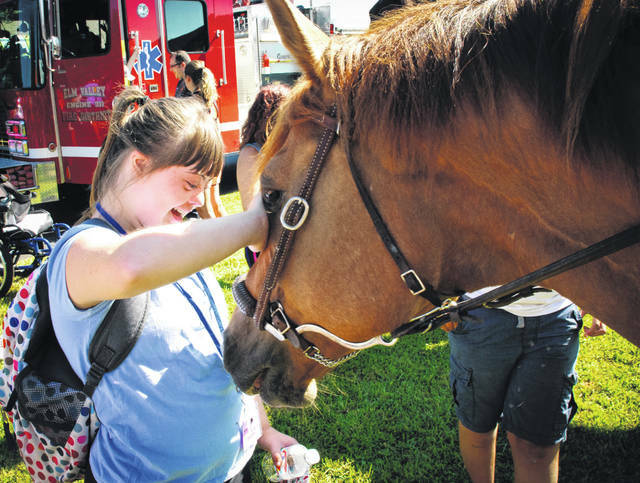 Once Recreation Unlimited camper Katie Godfrey, of Delaware, saw Chester, one of the horses of the Delaware County Sheriff’s mounted patrol, the smile on her face pretty much said it all. Campers seemed to be immediately drawn to the horse, whose gentle nature made him a target for their affection. The eyes of the campers grew two sizes bigger Wednesday when they got their first glimpse of the first responder vehicles parked in the compound of Recreation Unlimited, but it was the Delaware County Sheriff’s mounted horse patrol that received the most attention. “It’s the first time this year for the horses,” said Sandy Mackey, deputy director of Delaware County Delaware County Emergency Management Agency. The annual safety day event at the camp brings together first responders and equipment for special needs campers to see and touch firsthand. The event gives those with special needs a chance to try on the fireman helmets, see the big equipment, receive free coloring books, and meet the first responders. Mackey said by pulling all the first responders together in an event like this, it gives special needs people a chance to talk with the people that might one day respond to an emergency at their house. She said it helps for them to understand and not be afraid if an emergency does happen in their home. “Every responder at this event will tell you how great a feeling it is to see the big smiles when they sit in your truck or talk to you,” said Bob Lavender, Delaware County EMA’s operations manager, who has coordinated the event since 2002. Recreation Unlimited Executive Director Paul Huttlin said he has been with the organization now for 21 years and still loves every minute of the job. Recreation Unlimited provides year-round programs for adults and children with physical and cognitive disabilities and health issues. The organization serves approximately 3,700 individuals with disabilities and health concerns from 57 counties in Ohio. The facility is the largest provider in the state serving special needs individuals in sports, recreation and education. Huttlin said the camp schedules safety day during youth week at the camp in July every year. Recreation Unlimited is located at 7700 Piper Road, Ashley, in northeast Delaware County. This entry was tagged Bob Lavender, D. Anthony Botkin, First Responders, Pual Huttlin, Recreation Unlimited, Safety Day, Sandy Mackey, Sheriff’s Department Horses. Bookmark the permalink.